MAE SOT, THAILAND—For years the Burmese military junta, which renamed its country Myanmar, conducted brutal military campaigns against a score of ethnic minorities concentrated in the east. Among those who suffered the most were the Karen (or Kayin). Burma’s second largest ethnic group, they number around five to seven million people, about ten percent of Burma’s population. A large percentage are Christian, their ancestors having been converted back in the 1800s. UN organizations and private NGOs located in the city of Mae Sot along with the Karen leadership. About thirty-five miles north sits Mae La refugee camp. Established in 1984, its population exploded as a result of military operations by the Burmese army, or Tatmadaw, across the nearby border. The latter would invade Karen territory, destroy villages, kill animals, conscript porters, brutalize residents, and sow land mines. People had no choice but to flee. Perhaps a million Karen were displaced during the conflict. Over the years the strength of the Karen National Liberation Army ebbed. A ceasefire was agreed to in 2012. The camp’s population has fallen to some 50,000 Karen today. Still, Mae La is a de facto city, with traditional wooden homes on poles carpeting the undulating hills. U.S.-based Christian Freedom International has worked with the Karen for years. CFI trained medics, opened rudimentary but vital clinics, subsidized orphanages and churches, and otherwise helped mitigate the impact of war. At the group’s invitation I first visited the region nearly two decades ago, and saw how the Karen greatly appreciated the efforts of Americans devoted to standing with them in their time of need. During some of the ugliest years of fighting the George W. Bush administration allowed thousands of Karen refugees to settle in America. CFI, then headquartered in Sault Ste Marie, Michigan, assisted a number of these new residents, some of whom had attended CFI-backed schools while refugees, adjust to a very new culture and climate. Although opposition to immigration seems to dominate political headlines, local residents warmly welcomed these refugees. The Karen loved America, appreciated past U.S. humanitarian aid, and were grateful for the new opportunities afforded them. In Mae Sot CFI opened what it now calls Victory Bible Academy, a small but intense school for Karen students mostly in their teens. I visited HBI over the years at CFI’s invitation. It teaches practical subjects within a Christian framework, hosted orphans as well as kids sent by fearful parents. The students’ personal stories typically highlighted military assaults, family deaths, burning villages, and desperate escapes. Today the school has become a far more hopeful place. Kids come to learn skills for what they hope will be a more prosperous future. The facility is overseen by a redoubtable Canadian couple, Joe and Marnie Scott, who manage, teach, and serve. CFI President Wendy Wright reports that half of the school’s recent graduates are employed in some way aiding their own community. However, the bright economic future which students long for still looks far off. Educational and economic opportunities for Burmese citizens living in Thailand are limited. There is little legal or regulatory protection for business in Karen State in Burma. Electricity is limited. Land mines pepper much of the territory. Moreover, peace remains tenuous at best. Although a civilian government effectively controlled by long-time democracy activist Aung San Suu Kyi has taken root in Naypyidaw, it does not control the military. The horrific attacks on the Rohingya people raise questions as to the military’s willingness to tolerate ethnic diversity. Negotiations with the Karen and other ethnic groups to turn the current ceasefire into a permanent peace have achieved little. Indeed, the Karen still suffer under the Tatmadaw’s heavy hand. In March, shortly after I visited, the military invaded the township of Hpapun, confiscating land and displacing thousands of residents from more than a dozen villages to build a road. As yet, the threat of resumption of widespread hostilities in Karen State appears distant, but serious fighting continues against other ethnic groups, such as the Shan and Kachin, another largely Christian people. Some Karen worry about the ability of their leaders, both the KNU and KNLA, to stand up to further pressure. Unfortunately, the West has few good options concerning Burma. 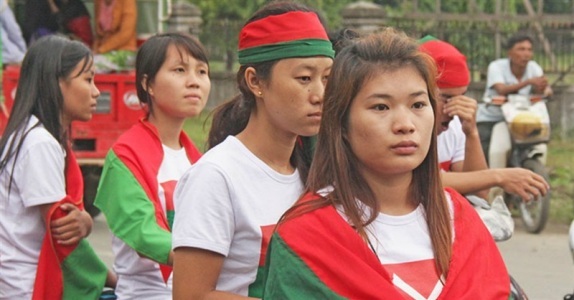 How to encourage the government to consummate peace with its citizens, including the Karen? The Trump administration doesn’t appear to be paying attention, let alone seeking a solution, to the increasing conflict. For Burma much depends on the government ending its multi-front war on its own people.